Our school is founded in 1995 and wants to be an alternative to the existing music academies. 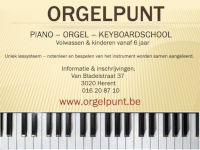 Inquire now about our new piano - keyboard and organ courses. Start September 11. Enroll on time. Test lesson possible. Inform about the available days / hours. Enrollment is possible from Tuesday through Saturday between 10:00 and 18:30, also available by phone. The classes are open to all ages from 7 years. Classes are taught in groups, maximum 4 to 5 people per group. You don't hear of what is being played from eachother. The teacher will explain the lesson personal to you. Experience in piano playing? Then we continue at your level. The benefits of our system. There is no experience required. You can all start from the bottom. Learning to play the instrument and music theory are taught together. You learn at your own pace and level can be adjusted to the student. Textbooks are available in our store. You can choose between classical or modern music or a combination of both. In the modern method yields a mixture of rock, pop, ballads, and jazz. We replace our instruments on a regular basis, sou you always play on modern machines. It is also possible to play baroque and classical music on a clavichord or harpsichord. We also have a modern Grand piano at our disposal. No instrument? You can rent a piano or a keyboard. So you don't have to worry about purchasing a musical instrument. You choose a school year or a school term. If the school term is over, you enroll again. During school holidays there are no lessons. The price of a school term is € 85.00. The price of a school year is € 245.00.